Mendoza is a pretty relaxed city; sidewalk cafes for lingering over lunch, plenty of green, peaceful parks, uncompromised siestas and by Argentine standards, relatively early nights. This is true all year-long, except for during the Vendimia. 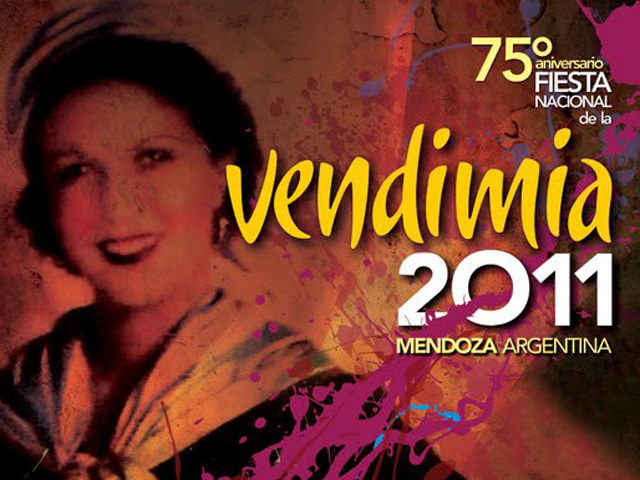 In February, March, and April Mendoza comes alive for the harvest season, and the Festia de Vendimia is the biggest event hands down. It marks the culmination of months of anticipation and preparation, and Mendocinos pull out all the stops for a serious four-day party. That's right, four full days of celebrating wine...we could definitely get used to this! It's not just the grapes everyone's excited about. While the origins of the Festia de Vendimia are rooted in the grape harvest, most people care about the parades and, most of all, who will be crowned la Reina de la Vendimia. To us, it was like the Miss America pageant of wine; each town within Mendoza nominates one beautiful, young woman as their queen. Then, during the next few months each queen 'wannabe' poses, campaigns, makes appearances and touts her social and intellectual accomplishments. The city walls and store fronts are plastered with posters of each girl and everyone has their favorite. It's not until the parades start though, that the hype really gets going. Friday and Saturday night mini parades snake through the streets blaring music, throwing grape bunches to spectators and pulling the queens before the public on the beds of Semi-trucks. Yeah...kinda trailer park-ish I know. I mean little girls dream of white stallions or corvettes, NOT semi-trucks...come on Mendoza! But, what the hell, its practical and roomy! The suspense finally wanes late Saturday night when the votes are cast and THE Reina of the Vendimia is officially declared. It's not until the next day though that a HUGE parade stomps down every street celebrating the new queen. There are peruvian dancers, Native American musicians, carnavale girls, local school bands, belly dancers, confetti, street vendors, balloons, more grapes, music and of course all the other Reinas on their respective semi-trucks. This all begins around 6am and ends by mid-afternoon, at which point parade-weary revelers head to the park or their back yards for an asado, and to celebrate the vendimia properly: with lots of wine. Of course, the next two days are holidays, so partiers can nurse their hangovers, the Reinas can take off their make-up and Mendoza can be put back together again so it can all happen again next year.